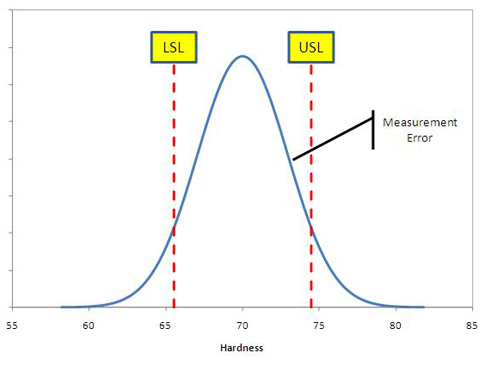 The question I received was, “Why don’t you use a standard hardness coupon instead of production material?” It boils down to two words: external validity. Let’s say I'm testing my Hard-A-Tron on these standard, traceable to NIST coupons, and the gauge passes. What does this tell me about my ability to measure the cylinders I fabricate? Well, not much if anything, actually. The coupons are flat—I just drop them onto the measuring stage. The cylinders are, well, cylindrical, so I might have some sort of a fixture to place them in to hold them while I test with the device. Does the fixture have some springiness to it that might affect the reading? How about the extra height above the stage—could that change the reading variability? And the fact that I'm measuring a curved surface rather than a flat one—how might that change the as-measured hardness? Well, we don’t know—that was not part of the study using coupons. Using similar reasoning, I want to perform the MSA in the environment in which the device is actually used (perhaps dirty and poorly lit) and by the people who actually use it, instead of me alone in a nice clean, bright lab. My research question is not, “How well does my device measure coupons?” but rather, “How well does my device measure my cylinders in the production environment?” And to do that, I want to replicate as much of the actual process as I can. So let’s think through our sources of measurement variability here. 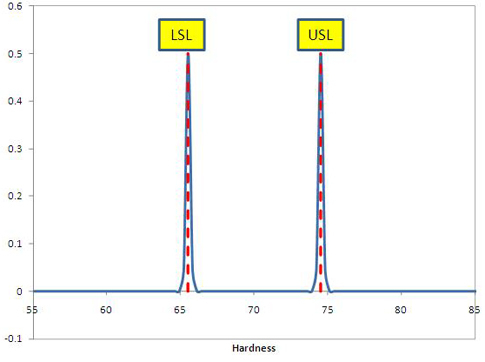 Each of the samples we are measuring probably has some different “real” hardness, so we have part-to-part variability. We don’t want to count this as part of our gauge variability though—it is inherent in the parts. Each operator might have a different bias off of the “real” number. Regardless of the fact that the different parts could be totally different hardnesses, the average of all the parts should be a particular number, right? So we will take an average across all the readings for each operator. If those numbers are statistically different, then the operators are biased compared to each other. (A repeated measures t-test would be the way to statistically test that, but that is a little beyond the scope of this article.) The difference between the two averages will give us an estimate of the reproducibility variability. … and there is one more “mystery component” that I am not going to tell you yet. Because we have two operators as well as two measurements, we use an expanded table to look up d2. Thankfully, that table is built right into the spreadsheet. We have two different ranges—the average of the two operators’ ranges, and the range between the averages for each operator. Dividing by d2 gives us the estimate for the within-operator and between-operator variability, repeatability (σRPT) and reproducibility (σRPD) respectively. To estimate the total variability (σe) including repeatability and reproducibility, we need to add together the variances (you know we aren’t allowed to add standard deviations) and take the square root. 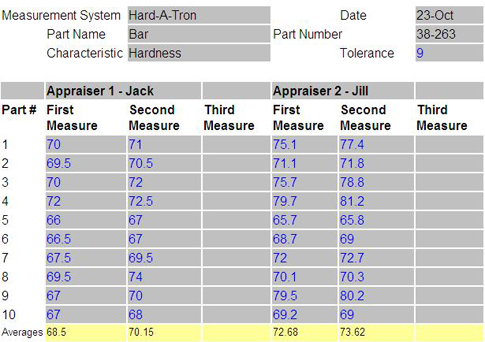 So Jack averages a little lower than Jill (without a known “real” value for the parts, we don’t know if either Jack or Jill has the right hardness). Jack has a little bit more variability on average within part than Jill. (Note again that for our simple MSA we have not shown that these differences are statistically significant.) We have used those ranges to estimate the variability due to reproducibility and repeatability, and added the variances and taken the square root to get the overall variability of the Hard-A-Tron as used by Jack and Jill. The reproducibility variability is higher, indicating that the major source of the variability is from operator to operator. This points us to how we can improve our measurement system—we need to figure out how to get Jack and Jill to agree with each other better. Maybe we look at the standard operating procedure used with the measurement device, maybe we watch how they set up the measurement. Or maybe… but that would be giving away the mystery; and I haven’t even assembled everyone in the drawing room. Now for a simple question, there is a lot of confusion about how to answer it, so I am going to walk through this to make sure you understand why we use the metric we use. I need you to keep focused on the question we are trying to answer, though. Determining if something is in or out of spec is an action near and dear to many of our hearts, I am sure. So let’s make a drawing. Now, this is the same part with the real average right in the center of the spec. With this much variability, a part that is smack in the center of the spec would be scrapped or reworked about 12.754 percent of the time due only to our measurement variability. That is not so good. This part really has a hardness of 67, so it is in spec, but 31.128 percent of the time we would say it was out of spec. Even more amusing, we would actually have said it is out of spec on the high side 0.5546 percent of the time. Last one—what would happen if it were actually out of spec at 65? The good news is that we would actually recognize that it is out of spec about 56.7875 percent of the time. (Remarkably, 0.0648 percent of that is shown as over the upper spec.) The bad news is that 43.2125 percent of the time, we would think it was in spec, and send it off to our customer. Oh no! Can you spell “termination with cause”? As a side note, we know what will happen if something is measured and is categorized as out of spec—we remeasure it, right? Maybe it will “go back in.” But as you can see in this case, due to the high measurement error, we should be remeasuring even if it is inside of the spec.“Quick—we are in spec—remeasure it.” How many times do you think that happens? A crazy graph, I know, but for any given hardness, we can read off how likely it is we will come to the wrong conclusion about its conformance to spec. The worst case is when the part is really on the spec, which is (for a symmetric distribution anyway) always going to be 50–50. The further from the spec, the easier it is to make the right decision. But with this system, we are always running a pretty big chance of mischaracterizing our part. So clearly, this is a measurement system that has real trouble accomplishing what we need it to do—correctly determine if a part is in or out of spec. Whatever metric we end up using has to reflect this inability. That 5.15 gives you the width of 99 percent of the measurement error. Here you are taking the natural tolerance of the measurement error instead of 99 percent of it. The difference is small, but this one makes more sense to me. Plus 6 is easier to remember than 5.15, but maybe that is just me. On the other hand, everyone uses 5.15 so I have pretty much given up that fight. Here are the spreadsheet’s calculations for %R&R. What does this number tell us? Dividing by the width of the spec gives you the proportion of the spec eaten up by measurement error alone. The smaller this number, the less likely you are to categorize something that is in spec as out, or out of spec as in. Or, as in our case here, if your measurement error itself takes up more than the whole width of the spec, the %R&R clearly tells you so by being stupidly big. Well, this is about as silly as before, but in a good way. Unless I am reeeeeeealy close to the spec limit, I am almost certainly going to make the right decision about the conformance to spec for that part. You can back-calculate the standard deviation you need in order to get a %R&R of 10 percent. For our Hard-A-Tron, we would need a standard deviation of about (0.1 ÷ 5.15) * 9 = 0.1748. Putting that in the equation above on the left, using the 2.953 as the sigma on the right, we solve for n and get 286. Umm, I don’t think we will be measuring our little bars that many times. Looks like we need to reduce that measurement error some other way. Here is where I finally solve the mystery. Did I distract you with enough stuff to make you forget there even was one? Go back and look at the data and follow the readings for a single part through Jack 1, Jack 2, Jill 1, and Jill 2. With a few exceptions, the numbers increase through time. The potential study we did gives us no direct information of stability though time, but this is a pretty gross change that is visible across each part. Could it be that the real values of hardness were changing with time and the operator-to-operator difference we saw was actually due to that? Well, as the metallurgists in the audience can tell you, that certainly can happen. 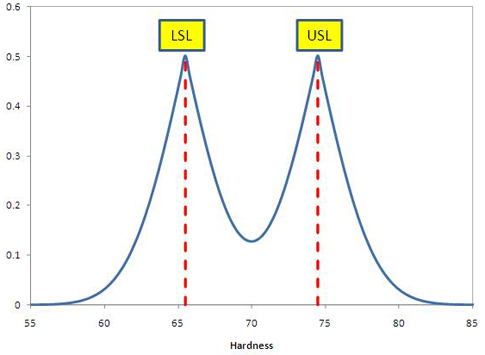 Either the metal itself gets harder with time (it ages) or the force exerted on the sample for each of the hardness measurements actually hardens the material nearby for the next test. That is what happened here, and that is the last source of variability—the hardness of the material itself was changing with time. In this case, it is impossible to isolate the change in hardness from the change in operator. (By the way, this is exactly why we do Jack 1, Jack 2, Jill 1, and Jill 2 in that order. If we had randomized across operator, we probably would not have noticed the time effect. As it was, this effect was confounded with operator, so while we might have spent time trying to figure out why Jill was different than Jack, we had a better chance of eventually catching the time effect.) 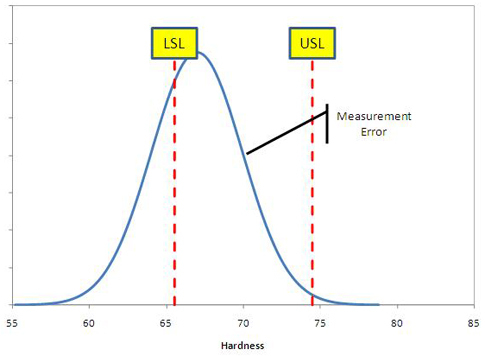 It turns out that in this case, hardness measurement is a Class III destructive test—the true value changes with time. And that is the end of the Mystery of the Maltese Hard-A-Tron. Now if I get a %R&R of 10 percent in the real world for a potential study like this, I would be happy—but not “I’ll buy your gauge” happy, since I have yet to really put it through its paces. To do that, I go and gather 25 parts that span the expected range of measurement, and have one or more operators measure each part five times or more. This will give us a little bit of information on the stability of the gauge, at least for the short-term, and so this study is cleverly called a short-term study. Here are some data from a short-term test. In this example, we are weighing a plastic preform before placing it into a compression mold. The weight specification is 465 ±50 grams. We are assuming that the measurement is independent of operator, so we only have one operator do the test. Each row is one of the 25 samples, measured in random order. Each column is the repeated measures, which were done in different random orders. We have been using this scale for years—and it has a digital readout. On the other hand, we have had a lot of defective parts for years too, and the area the scale is in is pretty contaminated with phenolic dust. What do you think? 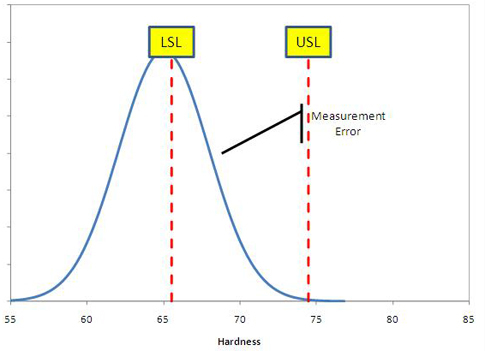 Is the mass balance capable of measuring that specification? Tune in next month to Mystery Measurement Theatre to find out.